Our days are lengthening by about 1.8 milliseconds per century. Brian is bringing the story of science to the world. Uncover the mysteries here. A day on Earth is longer than it used to be. The increase is tiny. Over the span of a hundred years the Earth’s day will increase by only a few milliseconds. It’s only been in the past few decades that we’ve been able to measure Earth with enough precision to see this effect directly. Using atomic clocks and ultra-precise measurements of distant quasars, we can measure the length of a day to within nanoseconds. Our measurements are so precise that we can observe various fluctuations in the length of a day due to things like earthquakes. Those fluctuations make it a challenge to answer another question. How has Earth’s rotation changed over longer periods of time? Variation of the length of a day in recent years. Image Credit: Wikipedia. Part of the reason Earth’s days are getting longer is due to the gravitational pull of the Moon on our oceans. The tides slosh against the Earth, gradually slowing its rotation. Over millions of years, this means Earth’s day was hour shorter than it is now, thus there were more days in a year than today. We see this effect in the geological record, which tells us an Earth day was about 22 hours long 620 million years ago. Trying to measure the length of a day between the recent and geological era, however, is difficult. Hundreds of years ago clocks weren’t accurate enough to measure this variation, and the length of a day was fixed to its rotation, making any such comparison impossible. But recent work has found a way to study Earth’s changing days. Although our ancestors of centuries past didn’t have accurate clocks, they were good astronomers. They observed and documented astronomical events such as the occultation of bright stars by the Moon, as well as solar eclipses. The occurrence of these events depends critically on when and where you are. If, for example, an astronomer in one city sees the Moon pass in front of a star one night, an astronomer in a nearby city will only see the Moon pass close to the star. By comparing the observations of these astronomical events with the actual time of their event as calculated from the orbital motions of the Earth and Moon, we know exactly when and where they occurred. 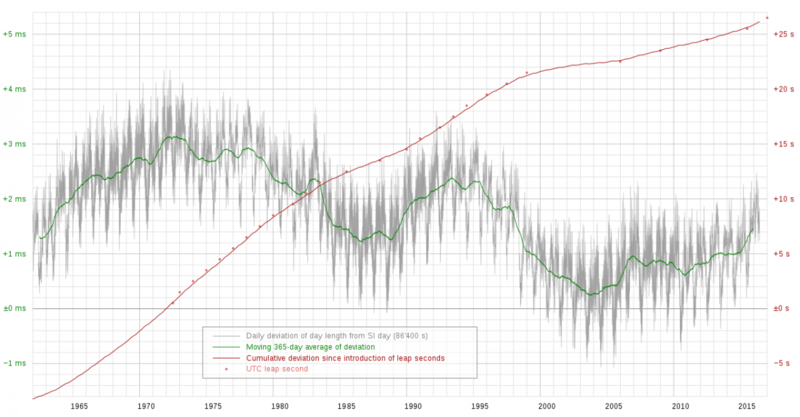 Fitting a history of observations together, we can get an average rate for the increase of a day. That turns out to be about 1.8 milliseconds per century. There are two things that are interesting about this result. The first is that it’s pretty amazing to be able to determine this rate from historical documents. The observations span more than two and a half millennia, and are written in various languages and locations. Gathering them all together and verifying them is an amazing effort. The other is that this rate is actually less than the rate theorized from the tidal effects of our Moon (about 2.3 ms/century). This is likely due to changes in Earth’s overall shape. We know, for example, that the melting of ice since the last ice age (about 10,000 years ago) has released pressure at the Earth’s poles, allowing it to return to a more spherical shape. This would tend to shorten Earth’s days a bit. The combination of these two effects give us the historical rate we see. Overall this work is a great demonstration of how history can speak to us. If we listen closely, we can even see the changes of time.